Do you remember a time, long ago, when phones were wired to the wall in your kitchen and had short, curly cords that only stretched about 3 feet? (Figure 1) I know it may be hard to remember such a time, but it wasn’t that long ago! 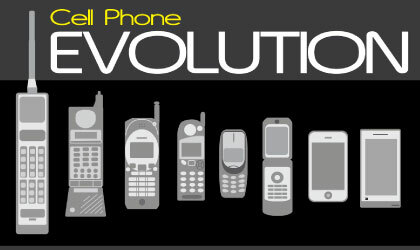 In a matter of about 25 years we have gone from the “Zack Morris” cell phone—costing about $3900; to web-capable smart phones that weigh less than 3 oz. and are only 1/3” thick—for as low as $200! (Figure 2) It’s pretty incredible to see how technology is rapidly evolving right before our eyes. If we’ve come this far in 25 years, what do the next 25 years have in store for us? Figure 1. Figure 2. Dating from 1980 to 2011. It seems like the minute you buy the latest and greatest piece of technology there is a new one being released as you walk out the front door of the store. At EIM we try to stay on the leading edge of technology, because we know that so many of you rely on it in your every day lives. We now offer an exciting new way to print your labels on demand… right from your very own mobile device! It’s a fast & accurate way for any individual user―like yourself―to utilize your own device to create custom labels right when you need them! BarTender® Enterprise Automation that comes with a Web Print Server and a printer like our easy-to-use desktop Zebra GX430T printer. This may seem like a laundry list but it’s so much simpler than that! As shown above, all you need is a network or internet connection, your own wireless device (be it a cell phone with web-capabilities—or a laptop/desktop computer) BarTender® Enterprise Automation, Seagull Web Print Server and a printer like our easy-to-use desktop printers. This may seem like a laundry list but it’s so much simpler than that! Setting # 1: Crowded Deli at lunch time in the city. YOU are the only one working the lunch shift, you run out of labels for your lunch specials and you have no one there to help you… what do you do?! Luckily, you have a cell phone with web-viewing capabilities and you remember just how easily you can solve this problem. Your boss recently installed BarTender® Enterprise Automation on your company network and you have your Zebra GX430T Printer—hooked up and ready to go—right on your counter. You simply take out your cell phone, go to your company’s Web Print Server through BarTender® and you quickly choose from your list of premade label designs. Once you select the right design, you type in the number of labels you need and presto― you have new labels instantly! Problem solved (and no one even knew anything had happened), phew! Setting # 2: Scientific Research Lab at a leading University. You hired a new intern and have been busy working together on a very important, time-sensitive test. You go to retrieve the labels you use for your test tubes and are shocked to realize you only have 100 labels left. You’re in a jam because you need to label the 350 test tubes sitting in front of you, and you just can’t wait. It has to be done now. Luckily, you have your music-playing device with web-viewing capabilities in your lab coat pocket! Since you have recently installed BarTender® Enterprise Automation on the laboratory computer system, you are about to dodge catastrophe! Since you have templates for of all the labels you commonly use―safely stored in your server―you quickly select the right label and print an extra 250 labels with a simple “tap on the screen”. While you are labeling the test tubes with the 100 labels you had in-house, your trusty ‘ol Zebra Printer was spittin’ out brand-spankin’-new labels―just for you―in an instant! Your new intern never even saw you sweat (…and thinks you’re incredibly smart, by the way…) and the labels matched the other 100 labels you had on-hand, perfectly! It was exactly what you needed! We’re curious. We all know that technology is constantly changing. Where do you see barcodes and labels heading over the NEXT 25 years? Share your thoughts with The Label Experts. You never know… you might be onto something that needs developing right now!